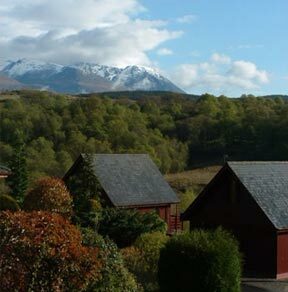 Our chalets are situated overlooking the River Spean Gorge with unhindered views to Ben Nevis, the Grey Corries and the Nevis Range. The pine lined chalets are well equipped with washing machine, fridge, full cooker, micro-wave, TV and shower. Each has two bedrooms upstairs, a double, and a twin, with linen provided. All are centrally heated with a focal point fire in the lounge area. Prices quoted are inclusive of all heating and hot water costs. Parking is available beside each chalet. We loved sitting on the veranda in the evening...a spectacular view, beautiful sunsets and a glass of wine...BLISS!